Go to the course Roster and click a student's name. For those with access to the student's advising view, click the course name in the transcript interface. The course summary has two views, one focusing on assignments, the other on attendance. Use the drop-down and back/forward buttons to toggle from one student to the next. Click the student's name to go to his profile. The Actions menu lets you email the student or flag him. You can perform a number of actions for incomplete students; follow the link for details. 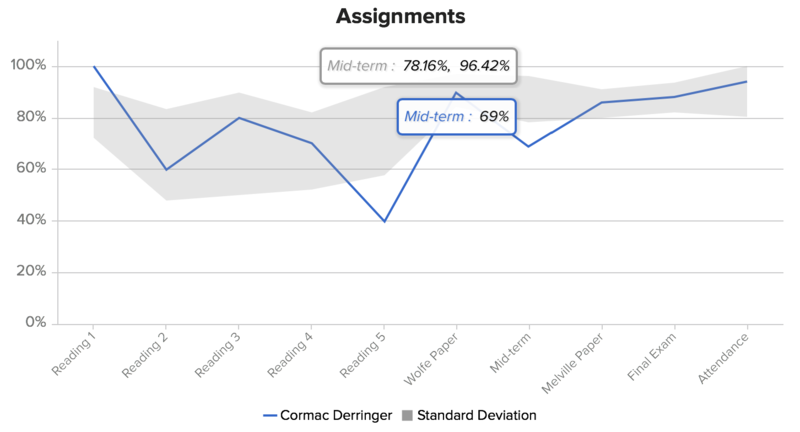 The grade graph charts the student's percent grades (the blue line) and compares them to the standard deviation calculated from grades from all of the course's students (the gray area). Hover over the blue line to see the student's grade, or over the gray area to see the standard deviation values. Below the grade graph you'll see a list of the course assignments, what percentage of the final grade each assignment is worth, the actual points the student earned on the assignment, and the percent grade. Click the assignment name to go to its page, where you'll find, among other things, the student's assignment detail. Likewise, you can go to the final grade/attendance page. Click Edit Grades to change any assignment grade or the final grade. If you're using rubrics, you can use the rubric to grade the assignment or review the student's rubric scores . Like the grade graph, the attendance graph charts the student's attendance percentage (the blue line) and compares them to the standard deviation calculated from the attendance stats of all of the course's students (the gray area). Hover over the blue line to see the student's attendance figures as of that date, or over the gray area to see the standard deviation values. Below the graph you'll see a list of the meeting times for which attendance has been taken and a running attendance percentage. Click the meeting time to go to its attendance page. Click Edit Attendance to change any attendance status for any meeting time. 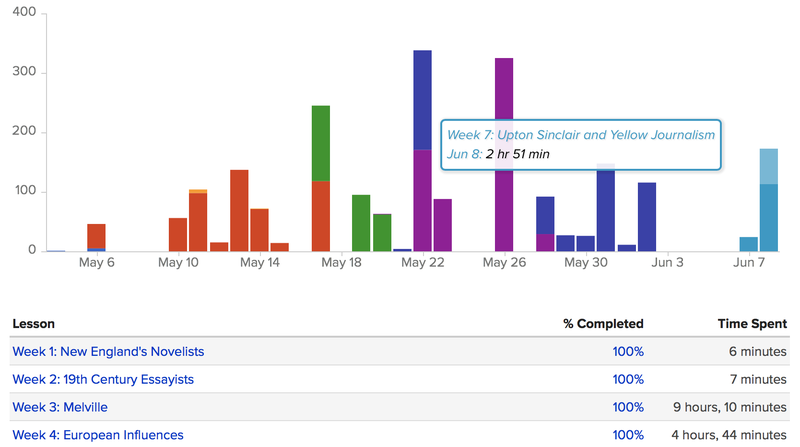 The Lessons view shows you how much time the student spent on lessons on particular dates. Hover over a bar to see how much time he spent on a given lesson on that date. Below the graph you'll see a list of the lessons together with a completion percentage and a tally of time spent on the lesson. Click the lesson name to go to its page. The percentage takes you to the lesson progress view. 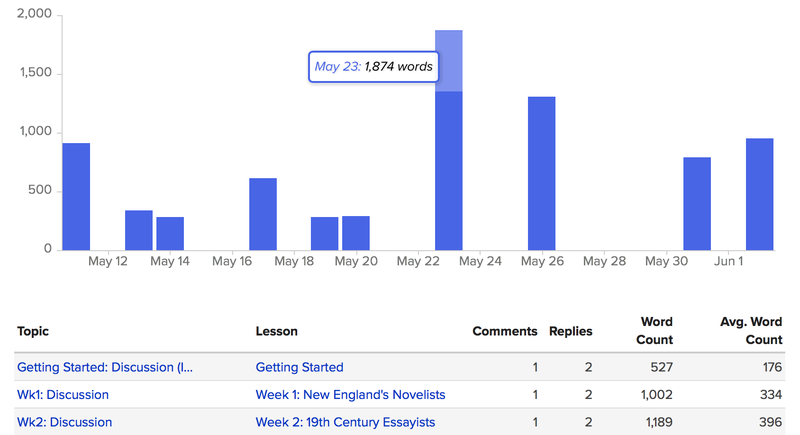 The Discussions view shows you how many words the student contributed to course discussions on particular dates. Below the graph you'll see a list of the discussions together with stats for comments and replies. Click the discussion name to go to its page. The Info panel gives you the basic roster information for this student—enrollment status, whether the student is getting a Pass/Fail grade, how many credits she'll earn if she passes, and any general notes on the student. Academic Admins and Registrars can edit any of these fields by clicking the field name (save for credits/hours—see below). Hours and credits can be edited depending on what you've permitted in Academics > Settings > General under the Course units by student setting. Course Faculty and Teaching Assistants can change a student's status between enrolled and incomplete. If the Enrollment setting on the Course Info view is set to allow Faculty to manage enrollment, then course Faculty can change the enrollment statuses to auditor, withdrawn, etc. Advisors cannot change any of this information. Flags may have been triggered by flag thresholds or were manually-added here on the student course summary. This interface lets you see current and past flags. The red flag was triggered by the flag thresholds established in Advising > Settings. Delia's performance in ths course is worrisome. If she fixes things up, the red flag can transition to a yellow flag and then even a green flag. The yellow flag from September 10, 2018 was added by the professor, Lita Mayhew. The yellow flag from August 10, 2018 was added by the professor, Lita Mayhew. It was marked resolved by Delia's advisor, Gemma Frye, and is considered a part of Delia's academic history. 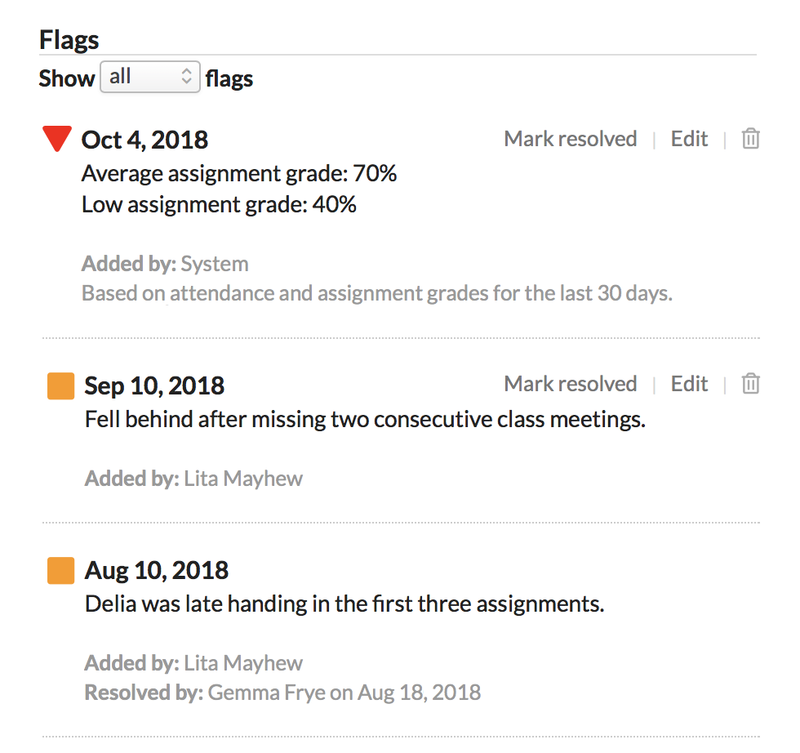 Delia's advisor, as well as any Academic Admin or Registrar, can click Mark resolved on any active red or yellow flag.